Vegas reportedly has over 120,00 hotel rooms but that number is in constant flux. There is a huge range in quality and price among Vegas hotels. A quick search on Orbitz and I find prices ranging from $19 for a 3 star hotel off the strip to over $1100 a night for the Skylofts at MGM Grand. Compared to other vacation destinations the cost of a hotels in Las Vegas can be pretty good bargain in general and you can get a quality hotel for a reasonable price. If you're already familiar with Vegas then you may know about the hotels in general. But if not then I'd do some basic research on the hotels in Vegas to find out what each is like. There are a wide variety of hotels in Vegas with something to suit everyones tastes. Most of the major casino resort hotels have a theme of some sort and some of them may be very appealing to you personally while others may be a turn off. The location of the hotel can have an impact on your other costs. If you stay downtown or off strip then you may end up with higher taxi cab expenses. Proximity to Las Vegas Monorail stations may be a valuable consideration if you plan to use the monorail. The site CheapoVegas.com has a good summary of hotels and their features from a 'cost conscious' perspective. You can see a lot of reviews of hotels on the TripAdvisor pages for Vegas. General vacation information sites like Frommers and Fodors have a lot of basic information on Vegas and the hotels there. Stay Mid Week - Weekend rates at the hotels are higher than week day rates. If you plan your trip so that you go Sunday to Thursday you can cut down your hotel cost considerably. Weekend rates could easily be 50-100% more the week day rates. Going during the week is one of the most surefire way to save some money on your hotel. Travel during the Off Season - According to Vegas4Visitors.com the slower times are November through Christmas, early January through February and June through August. I've mentioned before that hotels in Vegas have taken to charging sometimes hefty resort fees that are on top of the room rates. Resort fees tend to range from $5 to $20 and can make a difference over several nights. 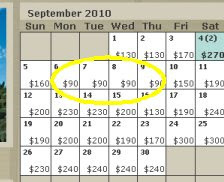 Make sure that you keep an eye out on the additional cost per night from the resort fees. This tactic may be a given for bargain shoppers but I'll cover it anyway. The more places you shop around for prices, then the more likely you are to find someone offering a good deal. I like to use a few resources to try and find the cheapest rates. Travelaxe is a website that will search various websites and get prices for all the hotels. This is one way to compare multiple online booking sites at once. I also like to check and compare the online booking sites like Orbitz, Hotels.com, Expedia and Travelocity. Lastly its always a good idea to go straight to the hotels own website to see if they have a cheaper rate there or if they are offering promotions that can give you a better value. I don't use Hotwire or Priceline when booking hotels in Vegas. From what I've seen I wouldn't see deals from Hotwire or Priceline in Vegas which makes them less attractive booking options. You can even spend more with Hotwire. For example I did a quick search and found that Hotwire was offering 4 star strip hotels for $89 and Orbitz had two hotels with lower prices. Hotwire and Priceline are non refundable and you are buying blindly so you may end up on a less desired location and the resort fees are unknown going in. It cant' hurt to compare prices with Hotwire to the normal booking services. You could also try a lowball offer on Priceline to see if you luck out on a good deal. You can also use Betterbidding to help figure out what hotels are being offered through Hotwire and Priceline. Vegas hotels are constantly offering bargain rates, discount packages and any other kind of promotion that will help get customers into their hotel and gambling in their casinos. If you simply go to a travel site like Orbitz.com then you will see some discounts like "stay 3 nights and save 20%". But to find other discount packages you need to look at the hotel websites directly. The promotional packages and specials from the hotels will often throw in free food, discounts or tickets to a show in their theatre. If the package combines non hotel bonuses with the room then figure out what those extras are worth financially and decide if you're likely to use them. For example a hotel may offer 2-for-1 drinks at their bar, 25% off at a restaurant and $25 match play on craps when you book the room. That all sounds good but you can usually get free drinks when you gamble, their restaurant may be over priced or not to your liking and maybe you prefer slots instead of table games so maybe those three incentives are of little true additional value to you. Personally I would only consider incentive offers that you know will give you added value or cut your costs for sure. If you have preferred hotels in Vegas then you can sign up for their email newsletter. If you've stayed there before then you may have already gotten on their newsletter. The email newsletters are a good way to keep aware of any promotional offers or discounts that the hotel may be offering. I just got an email from The Venetian offering rooms at $119 a night. Thats a good price for The Venetian which is a 5 star resort and one of the nicest places on the strip. At the other end of the spectrum I've got some older mails from the Excalibur offering rooms for $24 a night. The resorts off of the strip often offer cheaper rates. So you can potentially save a bit on the hotel by staying in a hotel off the strip. The major downside to staying off the strip is that you are away from all the action and various attractions of the strip itself. If you are going to have your own rental car or if you plan to stay in a casino the entire time you're in Vegas then a location off the strip may make some sense. I've stayed in a hotel on Fremont street a couple times and the price beat anything elsewhere. Off strip hotels often have free shuttles that will take you to the strip. Personally I think that the best 'value' in Vegas for my own personal preferences are the 3 star hotels on the strip. This location works well if you want decent quality accommodations and easy access to all the attractions on the strip. You could find lower prices off strip or down town, but that will involve more travel and/or lower quality hotels. Rates start at $25 a night with NO resort fee. I stayed here once or twice many years ago. I liked it OK at the time. Its getting old and is nowhere near as fancy as the typical strip hotel. The location is great. I haven't been here for several years so I don't know how well its held up. I stayed at the Sahara a few times over the years. It has a monorail stop and the monorail station is near the guest room elevators. But its getting old and its very far north on the strip. The food in the buffet was not very good. Note that you have to pay more for non smoking rooms. Rates start at $28 a night with $10 resort fee. I've stayed here at least a couple times. The hotel is in a prime spot on the strip. The decor is neat if you're into the medieval fantasy theme. Last time I stayed there the timeshare sales people were very annoying. If you choose one of the 3 hotels you'll get a very reasonable price with average quality accommodations and a pretty good location on the strip. But of course peoples tastes vary and I can't tell you what is the 'best' hotel for you, so you should pick the hotel that is right for your individual desires and needs. 1. In advance get signed up on email newsletters so you can get offers for discount stay rates. 2. Educate yourself on the hotels and the resort fees. 3. Decide in general what the parameters are for when you want to stay, what quality hotel you want, what price range you're looking at. 4. Hit online travel sites like Travelaxe, Orbitz and Expedia and search for hotels rates for your preferred time period. Filter based on quality of hotel you're looking for and sort the resorts by price. 5. Hit the hotel websites to see if they have any special promo deals.